Strange Culture: The Joker: Are you Joking? Well, the other Joker name that has been on the table is Robin Williams... and to me he is way, way down the list. Hmmm, Heath Ledger is an acceptable choice as long as the story line doesn't find him as Joker, working on a Montana sheep farm alongside Batman. "I wish I knew how to quit you Batman; but I cain't"! yeah, i'd never read any van Gogh quotes before that, i've only seen his art. it was an interesting insight. thanks for the comment! bettany would definitely be a far superior - um, - anything to heath ledger. unless we're talking 'pretty boy'. but nolan's got a knack. anybody who could make a good movie and slightly subdued performances from chronic overactors like the aforementioned robin williams AND al pacino (in the same movie, nonetheless) can do ANYTHING! Wouldn't it be weird if Micheal Keaton played the Joker? As disappointed as I am (and I am greatly), Ledger is better than Robin Williams, who has just been trying too hard the last few years. I still want to see Bettany get the role, though. 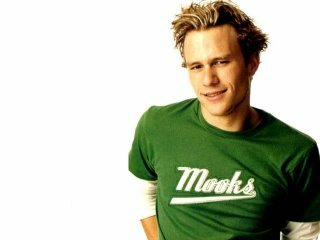 Heath Ledger is too much of a "hunk"--the Joker needs to be lanky and awkward, like the kid everybody knew in high school who thought he was hilarious and grew up to be the creepy Wal-Mart cart-wrangler. You know the type. Sigh. But whatever. Thanks for the heads-up. I have to admit I was a bit surprised that Ledger might have been cast as The Joker. I think Paul Bettany would be a much better choice. In fact, I'd say he may well be the best choice. Oh! The Joker!!! One of the best Batman comics I ever bought was "The Killing Joke" by Alan Moore, Brian Bolland, and John Higgins. It shows the origin of the Joker--would I be a happy fan if they based the next movie on this story!! The Joker is as evil as I've ever seen him, yet by the end of the story, you understand what drove him to his insanity, and you actually pity him. Quite remarkable! I suppose it remains to be seen how Heath Ledger would do. I personally think Steve Buscemi would've been an ideal Joker. Maybe even Gary Sinise. A friend of mine suggested Dane Cook, after seeing him screaming and going insane in his comedy act. I do think Michael Keaton would be a delicious irony as the Joker too. Just as long as it's not Cillian Murphy. I had read somewhere that Christopher Eccleston (Jude, Shallow Gave, Elizabeth and more recently Dr, Who) was being considered for the Joker. Can't stand Heath Ledger. Don't know why, just rubs me the wrong way. I think the Joker should be a bit older than Batman as well or at least poximal in age. BTW, Cillian Murphy already played Dr. Crane, so no worries about that one. Well, I was hoping for Johnny Depp (with a back-up plan of Adrian Brody), and the idea of Heath Ledger makes me very sad. I'd hoped that they'd at least cast someone who's capable of acting. Heath Ledger's acting ability is such that, if you were to push him off a cliff, he couldn't act like he was fallling. An interesting tidbit... and it might be that I'm being dense and not picking up on the fact that this fact is already subtext at this comment thread... but, anyway, Robin Williams was considered for the Joker in the first Batman Tim Burton film. I can't get past his role in 10 Things I Hate about You, and the fact that he's too hott to be the Joker. I'm kinda disappointed! why does it say "mooks" on his shirt? what does that mean? Darrell, you're beautiful! Adrian Brody would have been a much better choice! Damn why couldn't we have a say in casting? I know this is moot to say but i still think it wouldve been tyte to have mark hammil (formerly luke skywalker) play the joker. I guess its since he voiced him on the animated series and I credit that more than the comic for my interst in the franchise. Plus the irony of him playing the greatest hero and then one of the greatest villians would be too great.